Love is in the air. Whether you’re spending this month with someone special or whether you’re flying Han Solo, just know, your friends at Comicbookandmoviereviews are here for you. That goes double for those heroes in the DC Universe, what with Robert Venditti, Jesus Merino, and Van Jensen offering you just the distraction you need from another chalky, heart-shaped candy, or a little inspiration to give that cute girl from the coffee shop that box of chocolates you bought her. Despite some fierce competition, Barry Allen is still known as the Fastest Man Alive. But hey, even a superhero who can move at hypersonic speeds could do with some time to relax. After all, you'd expect Barry would be up for some downtime after putting away the man that killed Nora Allen whilst clearing his fathers’ name. But then again, when Central Citys’ finest enlist the aid of The Rogues to bring The Flash down, relaxation is the last thing on Barry’s mind. We’ve seen this story building alongside Barry’s war with Eobard Thawne (Professor Zoom) for quite awhile now, especially with Captain Frye's disdain for The Flash building and building by the issue. No good deed goes unpunished, as they say, and judging by the methods that the Captain is using, The Flash will have a lot of punishment coming his way. The story moves at a pretty brisk pace, which I kind of like in my comics. 20 pages isn’t a lot of time, so you have to make the best of what you’re given. Writing a story like this also means a lot of character interaction, which I’m happy to say was well done and pleasing to see, primarily with new relationships starting to form and watching old ones coming along. 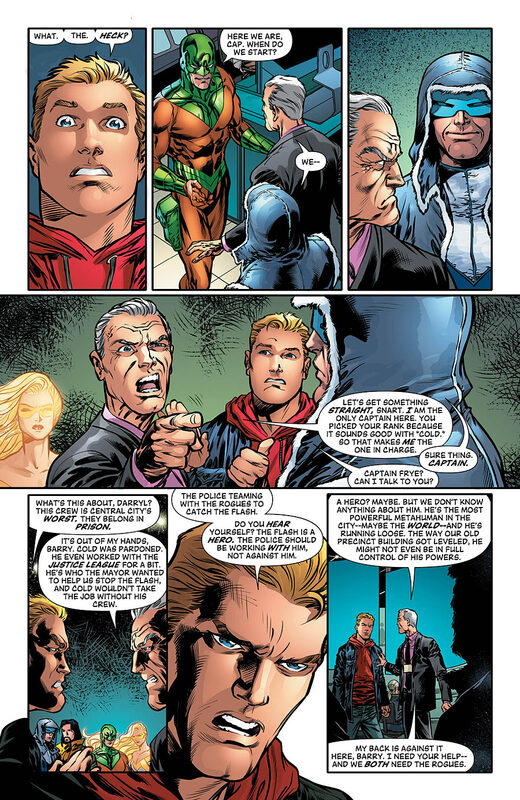 Captain Frye arguing names with Captain Cold, Henry and Barry getting some time to talk, and The Rogues attempting to stop The Flash led to some very smartly written dialogue. Van Jensen and Robert Venditti delivered well here, and I will be looking forward to these and more character moments throughout this arc, especially if they can be as heartwarming as Barry having lunch with his father. Another thing readers might notice is the change in art as well as Barry getting his classic gold and crimson costume back on. Jesuss’ first time on the title, I would argue is a success. Merino’s art gives the characters a youthful feel to them, without making it too obvious or letting it dictate anything about the characters themselves. From the introduction of The Rogues in this arc, to the actions of a man who seems intent on making The Flash look bad, this story is off to a solid start. Watching The Rogues help out with a fire and then immediately turn their weapons on The Flash left me with some good vibes. The Flash has been battling The Rogues for decades, and after some time has passed, it’s still fun to see. Of course, this version of The Rogues haven’t been together that long, and it’s likely that the conflicting attitudes of the members could prove their undoing. That’s something I’m sure we’ll see more of going forward. 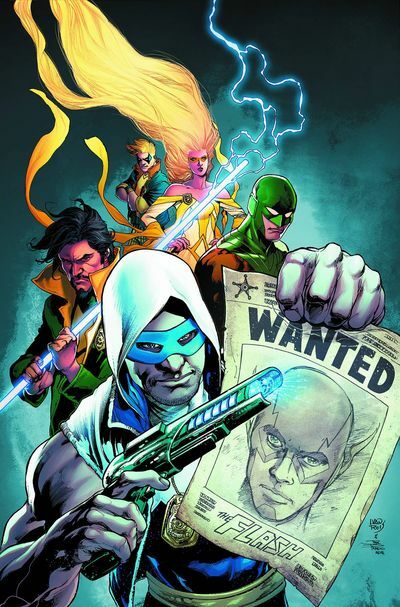 However, all this talk about The Rogues and Flash makes the two side stories quite interesting. Noticeably absent from The Rogues lineup is their resident hothead, Mick Rory, also known as Heat Wave. Plus it appears as though Wally West is hiding some secrets of his own. Secrets, mysteries, and more, are all on deck for this upcoming story-line. With DC’s Rebirth just months away, it will be interesting to see what DC has planned for their characters, and in particular, The Flash. A legacy character himself, DC looks to bring the concept of legacies back to the forefront. But then you have to ask yourself, can Barry Allen make it to June with Central City Police and The Rogues hot on his trail? Just stick with us, and you’ll have the answer soon enough! The Flash may be able to run faster than anyone else on Earth, but hiding? Well, that’s a different story altogether. When you’ve got the likes of Golden Glider, Mirror Master, and The Trickster on the hunt, along with Central City’s new drones monitoring the whole town, you’re in some hot water to say the least. All eyes are on the Scarlet Speedster, and that’s why the perfect song for The Flash’s current predicament is Rockwells’ “Sombody’s Watching Me!”. If I had to compare this comic to something out there, I actually find myself surprised to say this one was quite easy. This issue of The Flash was like… Hot Chocolate! An odd thing to compare a story too, but it goes back a bit to what I was saying earlier. The Flash has faced The Rogues countless times over the decades. 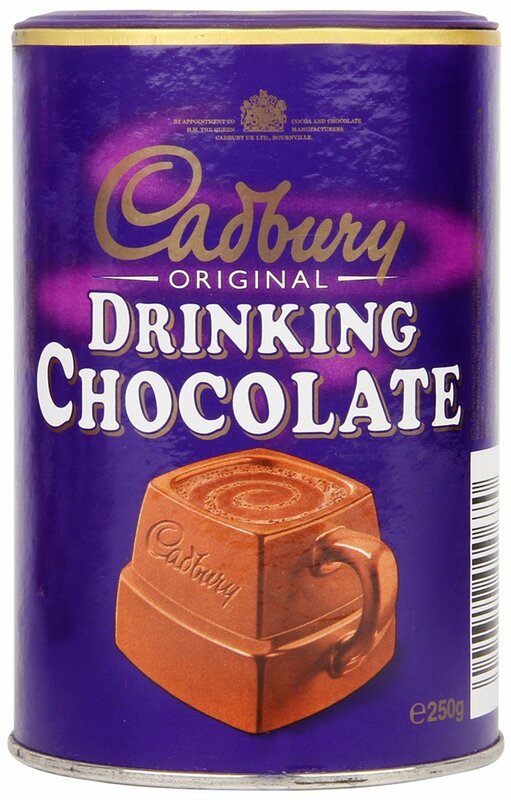 Yet, like Hot Chocolate on a cold, snowy day, there’s just something about it that brings back good memories and makes you smile. This time it’s a little different, given some perspective, but it’s a time-tested formula that really works. Again, like Hot Chocolate. So consider this twist the marshmallows! The Rogues are reunited, and it feels so good. 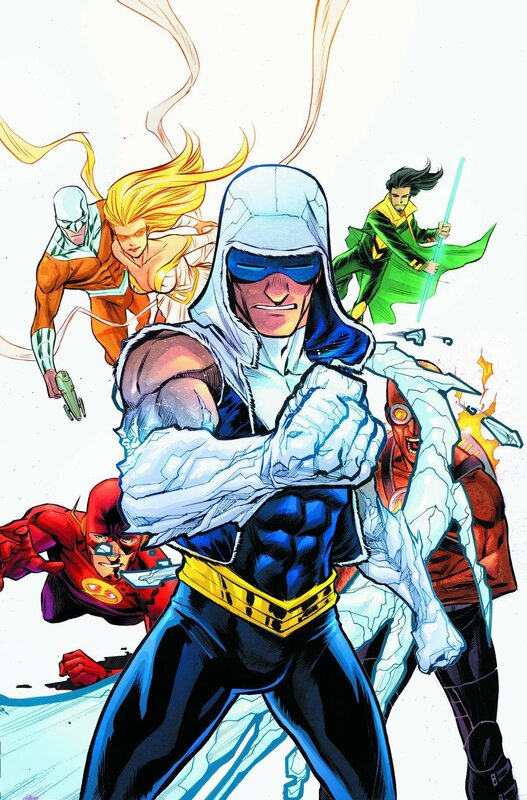 Except for Captain Cold, who seems a bit shocked at how off his old team is. I’m personally a big fan of The Rogues, but some more than others. So, I’m curious. Who is your favorite Rogue and why? Be sure to let us know in the comments, and come back next time for another sweet review of The Flash!